Wedding season never ends in India and often most weddings end up looking the same — the same old ballrooms or wedding venues that are found around the city. If you are planning to put a ring on it some time soon and want to kick things up a notch, continue reading. We’ve looked all around South India for the best resorts and hotels where you can host your big day. 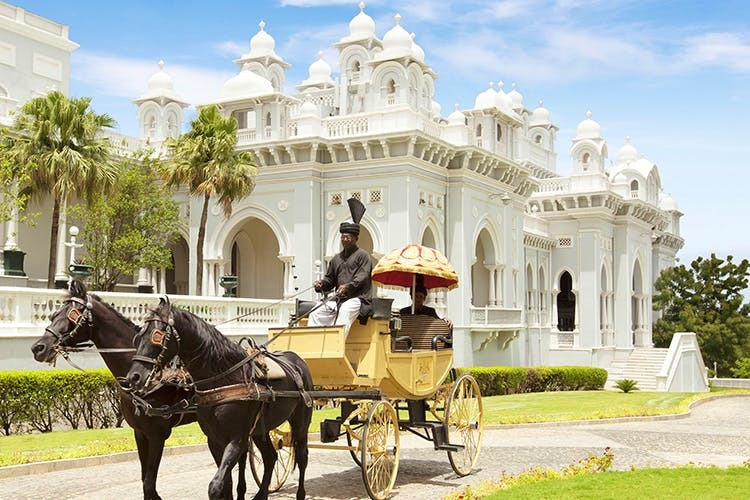 From Bollywood celebrities to corporate honchos, Taj Falaknuma is a favourite with everyone. Luxury and history come together here and you are assured of a breathtaking venue. You can take your vows in the splendid gardens that surround the pristine monument or even book their regal Durbar Hall for the main event. And you won’t have to worry a bit about your guests since the hotel comes with all the five-star luxuries you can dream of. Set on the banks of Lake Vembanad, Kumarakom Lake Resort makes for a picturesque backdrop. You can choose to get married by the edge of the lake, overlooking the waters, or even sign up for a boathouse where you can host the wedding. The resort is equipped with spas, restaurants, and swimming pools where your guests can hang out when they are not lazing in their luxury villas or suites. One of Kerala’s best known seafronts, Bekal is populated with luxury hotels and resorts. The one that stands out is the Taj property on Kappil Beach. Taj Bekal is basically 25 acres of sheer serenity by the beach. Perfect for an outdoor wedding, you can choose to have an intimate ceremony on the sandy shores or you tie the knot at one of their ballrooms. This place is best for smaller wedding parties since they have only around 70 rooms. Looking to get married near Bangalore? Head to the Taj property in our very own Madikeri. Surrounded by mist-covered hills that are lush with greenery, Taj Madikeri reeks of romance through and through. We recommend that you sign up a wedding blowout under the stars that includes candlelit tables and champagne. They also have a ballroom if you prefer an indoor wedding. Just a hop, skip and jump from the main beach, Raddison Blu offers sweeping views of the Bay of Bengal. Their manicured lawns routinely host stunning weddings that offers glimpses of the sea and is surrounded by coconut groves. If you are having a huge crowd, their larger-than-life ballroom is also an option. Your guests can kick back in pool-side or sea view villas, dine at the property’s many luxury restaurants, and even relax at the spa.